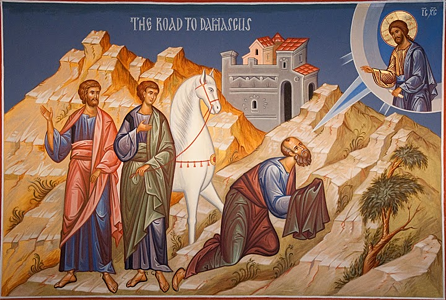 In the Acts of the Apostles there are three accounts of the conversion of St. Paul (9:1-19; 22:3-21; 26:9-23) presenting some slight differences. Jesus spoke to Paul : “I am Jesus, whom you are persecuting” (Acts 9:5b). Jesus was mysteriously identified with the group of people Saul had been killing like criminals. Jesus, he saw, was the mysterious fulfillment of all. Acts 9: 1-19 1And Saul, yet breathing out threatenings and slaughter against the disciples of the Lord, went unto the high priest, 2And desired of him letters to Damascus to the synagogues, that if he found any of this way, whether they were men or women, he might bring them bound unto Jerusalem. 3And as he journeyed, he came near Damascus: and suddenly there shined round about him a light from heaven: 4And he fell to the earth, and heard a voice saying unto him, Saul, Saul, why persecutest thou me? 5And he said, Who art thou, Lord? And the Lord said, I am Jesus whom thou persecutest: [it is] hard for thee to kick against the pricks. 6And he trembling and astonished said, Lord, what wilt thou have me to do? And the Lord [said] unto him, Arise, and go into the city, and it shall be told thee what thou must do. 7And the men which journeyed with him stood speechless, hearing a voice, but seeing no man. 8And Saul arose from the earth; and when his eyes were opened, he saw no man: but they led him by the hand, and brought [him] into Damascus. 9And he was three days without sight, and neither did eat nor drink. Ananias Baptizes Saul 10And there was a certain disciple at Damascus, named Ananias; and to him said the Lord in a vision, Ananias. And he said, Behold, I [am here], Lord. 11And the Lord [said] unto him, Arise, and go into the street which is called Straight, and enquire in the house of Judas for [one] called Saul, of Tarsus: for, behold, he prayeth, 12And hath seen in a vision a man named Ananias coming in, and putting [his] hand on him, that he might receive his sight. 13Then Ananias answered, Lord, I have heard by many of this man, how much evil he hath done to thy saints at Jerusalem: 14And here he hath authority from the chief priests to bind all that call on thy name. 15But the Lord said unto him, Go thy way: for he is a chosen vessel unto me, to bear my name before the Gentiles, and kings, and the children of Israel: 16For I will shew him how great things he must suffer for my name's sake. 17And Ananias went his way, and entered into the house; and putting his hands on him said, Brother Saul, the Lord, [even] Jesus, that appeared unto thee in the way as thou camest, hath sent me, that thou mightest receive thy sight, and be filled with the Holy Ghost. 18And immediately there fell from his eyes as it had been scales: and he received sight forthwith, and arose, and was baptized. 19And when he had received meat, he was strengthened. Then was Saul certain days with the disciples which were at Damascus. Paul's faith in Christ which engendered the vision, whereas according to the concordant testimony of the Acts and the Epistles it was the actual vision of Christ which engendered faith. After his conversion, his baptism, and his miraculous cure Paul set about preaching to the Jews (Acts 9:19-20). He afterwards withdrew to Arabia — probably to the region south of Damascus (Galatians 1:17), doubtless less to preach than to meditate on the Scriptures. On his return to Damascus the intrigues of the Jews forced him to flee by night (2 Corinthians 11:32-33; Acts 9:23-25). He went to Jerusalem to see Peter (Galatians 1:18), but remained only fifteen days, for the snares of the Greeks threatened his life. He then left for Tarsus and is lost to sight for five or six years (Acts 9:29-30; Galatians 1:21). Barnabas went in search of him and brought him to Antioch where for a year they worked together and their apostolate was most fruitful (Acts 11:25-26). Together also they were sent to Jerusalem to carry alms to the brethren on the occasion of the famine predicted by Agabus (Acts 11:27-30). They do not seem to have found the Apostles there; these had been scattered by the persecution of Herod. Apostolic career of Paul This period of twelve years (45-57) was the most active and fruitful of his life. It comprises three great Apostolic expeditions of which Antioch was in each instance the starting-point and which invariably ended in a visit to Jerusalem.